The Bentley EXP 9 F concept has the brand's trademark matrix grille and round headlights as well as wheels that hark back to 1920s Bentley Le Mans racecars. 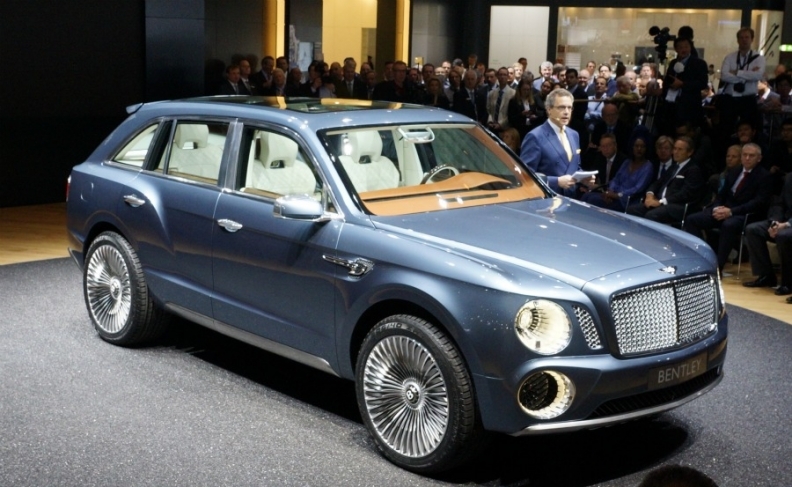 GENEVA – Bentley has revealed an SUV concept at the Geneva auto show, saying it could become the brand's third model line. The all-wheel-drive EXP 9 F prototype is powered by the Volkswagen Group subsidiary's 6.0-liter, W-12 gasoline engine, but Bentley said that it was also considering hybrid power for the first time. "We know that Bentley customers already own SUVs. With the EXP 9 F, Bentley is making a clear statement of intent that we have both the expertise and desire to meet and exceed their expectations," Bentley CEO Wolfgang Duerheimer said in a statement. When asked earlier this year about Bentley's expansion plans beyond the Continental and Mulsanne model lines, Duerheimer told Automotive News Europe: "The cornerstone of our strategy is the broadening of our product portfolio with an SUV." As well as the trademark matrix grille and round headlights, the concept includes details such as central wheel nuts for the 23-inch alloy wheels, harking back to 1920s Bentley Le Mans racecars. 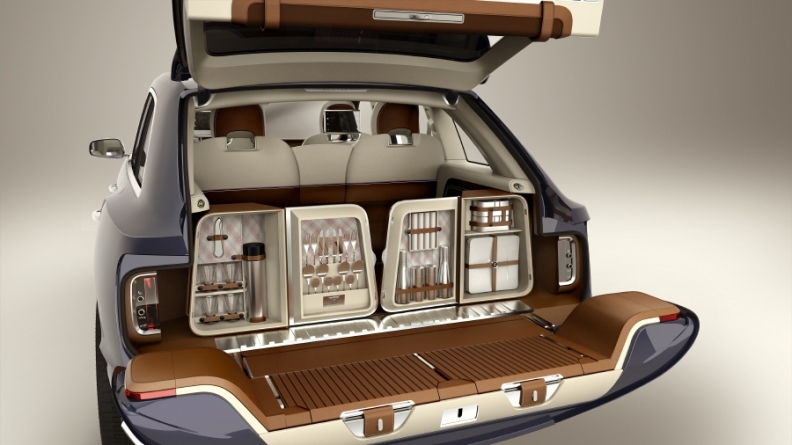 The Bentley EXP 9 F concept's tailgate is designed as an impromptu picnic bench. Two hampers slide out on rails while an awning offers weather protection. Cabin materials ranging from wood to gunmetal combine "luxury with utility," according to the company. Seating is described as 4+1, with the reclining rear seats also sliding forward to offer more trunk space. The lower half of the split tailgate is designed as an impromptu picnic bench. Two hampers slide out on rails while an awning offers weather protection. Duerheimer told Automotive News Europe earlier this year that sales of a Bentley SUV could hit 25,000 in total, with "conservative" annual predictions of 3,500 to 5,000. He estimated the car could be on sale within three years. Strong demand for SUVs in China is behind the creation of superluxury crossovers. Lamborghini, which is also owned by VW Group, will unveil an SUV study at the Beijing auto show in April. Maserati showed an SUV concept called the Kubang at the 2011 Frankfurt auto show. The Fiat subsidiary will start production of the model in 2013. In the first two months of 2012, Bentley sales increased 47 percent year on year. Of the 894 cars sold, 324 went to China, representing a 66 percent increase on the previous year. Last year, Bentley's sales increased 37 percent to 7,003. The company's best sales year came in 2007 when its volume reached 10,014 cars.